SustainableWork: My Kiva portfolio, May 2011. 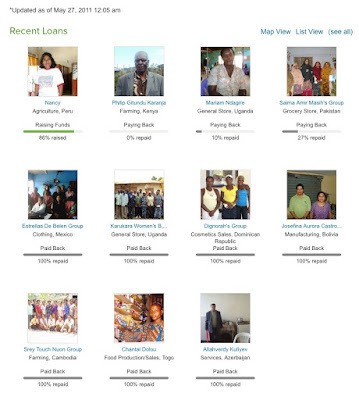 "A hand up to entrepreneurs"
My Kiva portfolio, May 2011. "A hand up to entrepreneurs"
I really enjoy working with Kiva. They have created an amazing business model that connects people and opportunities worldwide through lending. This crowdfunding model is moving toward approval in the United States as a new mechanism for funding small businesses. "We're so excited that you've chosen to give a hand up to entrepreneurs working towards better lives." When this kind of crowdsourcing model can be directed toward new business startups and expansions in the U.S., job creation will flourish. Kiva lets me be a micro volunteer - in short time slots that allow me to make a little bit of difference in circumstances and places that are important to me. What a cool org. Thank you Kiva for the wonderful entrepreneurship opportunities you help fund, and the dreams you inspire worldwide! Hi - I am definitely delighted to discover this. cool job! Very effectively written information. It will be useful to anyone who usess it, together with myself. Keep up the nice work – for sure i will take a look at more posts.